Having been based in Bath for almost 30 years, in 2014, Simon and Bev moved to a new home and life in Crackington Haven, north Cornwall where they continue to share their passion for Ashtanga yoga and Ayurveda. They are constantly inspired by the clear light, landscape and sea of this very special place. They enjoy walking and kayaking along the beautiful Cornish coastline as well as cultivating their own organic garden. Simon has practised and taught Ashtanga yoga in the tradition of Sri K Pattabhi Jois, Mysore, India for more than 15 years. In 2006, Simon was authorised by Guruji to teach the Primary Series of Ashtanga yoga and in 2010 Sharat gave him permisson to teach Intermediate Series (Level 2 Authorisation). 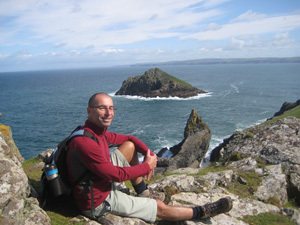 Simon is also an experienced British Wheel of Yoga teacher (qualified in 2008). Despite living alongside Bev's passion for yoga for almost 20 years, Simon didn't embark on his own yogic journey until 1999 when he was in India and in the company of many enthusiastic Ashtanga practitioners. Simon initially studied with Lino Miele and Tina Pizzimenti as his primary teachers. In 2002 Simon began making regular trips to the KPJ Ashtanga Yoga Institute (KPJAYI) in India to study with Sri K. Pattabhi Jois (Guruji) and his grandson Sharat. Simon's practice started out very much focussed on his reluctant and often painful physical body. However, the Ashtanga practice has brought about a complete metamorphosis in him from a career focussed IT consultant with a heavy, stiff, muscle bound weight-training and cyclist's body into a full-time yoga teacher and practitioner. Today his Ashtanga practice is a remarkable synchronised meditation of breath, body, mind and spirit with a grace and beauty that embodies the tranformative power of this yoga system. In 2002, Simon started teaching alongside Bev (who started Ashtanga Yoga Bath in 2001) and he established Ashtanga Yoga Swindon in 2005. Since moving to North Cornwall in 2014 he continues to support the schools in Bath and Swindon, and now has a small yoga shala in Crackington Haven where he teaches a weekly class schedule and runs practice intensive weeks. Simon's experiences have given him a firm belief in the ancient yogic wisdom embodied in the Ashtanga method. The concept of lineage is a very important part of maintaining this wisdom. Sri K. Pattabhi Jois passed on the method as he was taught by his teacher Sri Krishnamacharya and Simon follows in this tradition by passing on the method as faithfully as possible. In his teaching, he uses the deep understanding that he has developed through years of study, practise and teaching to make the Ashtanga practice, a style of yoga that is all too often perceived to be very demanding, accessible to students of all abilities, ages, shapes and sizes ! Bev started practising Sivananda Yoga in 1979, when she was 16 years old. She started teaching under the guidance of Pauline Hall in 1998 and qualified as a British Wheel of Yoga teacher in 2001. By pure chance, Bev met Lino Miele, Tina Pizzimenti and Gwendoline Hunt in India in 1999. With them she discovered the beauty of Ashtanga yoga. At the same time Bev met her Ayurveda teacher, Vijayan and has since devoted her life to the two ancient sister sciences of yoga and ayurveda. 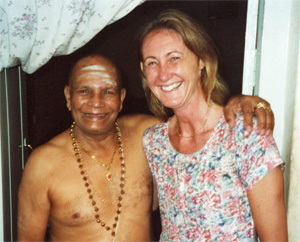 In 2000, after being encouraged to do so by John Scott, Bev travelled to Mysore to study with Guruji. Guruji's kindness and innate understanding of the healing power of the practice was evidenced as he took his new student under his wing and worked closely with her difficult practice. In 2004, Guruji gave Bev the authorisation to teach the primary series of Ashtanga yoga. Today Bev assists Simon in his teaching committments as and when required. Bev's teaching very much reflects her own experience of yoga - that is one of self-healing. As a teenager, Bev was diagnosed with a scoliosis (curvature of the spine). Once she started practsing yoga, the therapeutic benefits of yoga were immediate and motivated her to adopt a daily yoga practice which supported her through University studies, a professional Chemical Engineering job and hobbies of cycling, running and Triathlon. Bev's life seems to be one long journey of self-healing - in 2008, she was diagnosed with a severe liver disease. The invasive western medical treatment for her condition is so against her beliefs regarding health and well-being that today Bev fully embraces a life of self-healing using her own knowledge of yoga, Ayurvedic treatments administered by her teacher Vijayan together with healing meditation practices that she learnt from the Tibetan Buddhist practitioner, Rob Preece. Today, when sharing yoga practices with others, Bev is always faithful to the direct lineage of her teachers. However, she also uses the knowledge gained from her own deep experience of self-healing through physical and emotional transformation.